In a recent blog post about the Perfect Summer Cheeseboard, the cheesemongers I asked were universal in their love of goat’s cheese in the summer. Variously described as ‘fresh’, ‘citrusy’ and ‘luxurious’, it’s a great summer choice. Think herby tarts and fresh salads, grilled sandwiches and warm frittatas. There’s a soft goat’s cheese out there to suit everyone’s tastes – and in the last thirty years, there’s been a huge upsurge in British goat’s cheese. For those not keen on a ‘goaty’ flavour, cheeses like Capricorn, Pablo Cabrito and Rosary are fresh, nutty and lemony whilst those who prefer a full-on-butted-across-the-farmyard tang might like an aged Wealden. There’s even a blue-veined goat’s cheese, the spicy Talley Las from Wales. 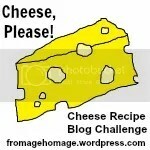 Want to take part in July’s Cheese, Please! Recipe Blog Challenge? Check out the full rules here. Write a recipe post using the featured cheese of the month and post it on your blog. Excellent! I tried to make sure it was a universally-available cheese this month. And very summery too, I think. I will get my thinking cap on and join in!